Food search behaviour in cod, Gadus morhua, was studied by means of a stationary positioning system. Six fish in a fjord in northern Norway were tagged in situ by allowing them to shallow bait-wrapped acoustic tags, and their swimming behaviour was continuously recorded. The fish exhibited a diel activity rhythm, with higher swimming speeds and a larger range during the day than at night. Chemically mediated food search was studied in periods of both high and low activity by setting a string of baits in the morning and at night. During the period of high activity, more fish localized the baits (70 versus 45% of the observations) and the time to localization was 50% shorter, indicating that high swimming activity increased the probability of encountering the odour plume and the odour source. No diel variations in the response threshold to olfactory stimuli were found, as the proportion of fish in the odour plume that responded rheotactically, and their response distances were similar in the two periods (240 and 227 m respectively). Cod performed area-restricted searches on encountering the string of baits during the day. 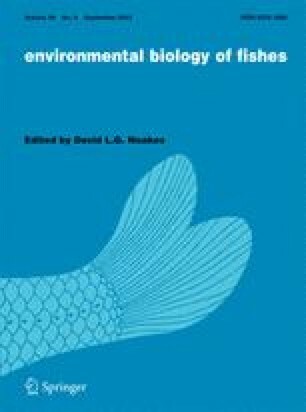 The probability of cod detecting prey by taste receptors, encountering the odour plume of prey or localizing a stationary food source after olfactory stimulation should be relatively independent of light, and this could explain why cod were active throughout the 24 h cycle. On the other hand, the visual detection distance and the ability to capture active prey are influenced by the light level, resulting in higher activity during the day.